Published on febbraio 1, 2019 in Allenatori, Calcio e Mental coaching. 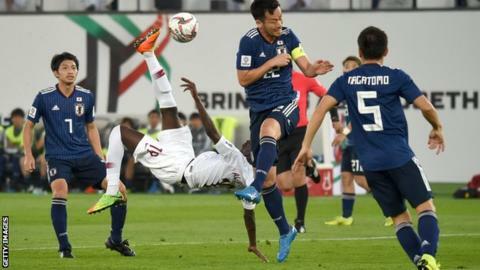 0 Commenti Tag: Asian Cup 2019, Japan, motivation, Qatar. Incredibile che una squadra cresciuta in pochi batta il Giappone. Forse c’entra anche la motivazione? Published on novembre 5, 2014 in Generale, Libri, Mental coaching e Stress. 0 Commenti Tag: current, gabriele oettingen, motivation, penguin group, positive thinking, rethinking, woop. In my job as mental coach, I often find myself in the situation where the athletes said: “My performance was great, all was going very well, than suddenly I did a mistake, I do not know the reason, I did the same things done just at that moment. I was not mentally ready to cope with an error, beacuse I was so well prepared. Since that moment the quality of my performance started to decrease and I lose myself and the competition.” This event is possible and fequent because often the athletes are too optimistics about them. They think: “I’m fit, with a strong and right preparation. I’m mentally tough, What could it happen to me? Nothing!” A tennis player lose a match after she was 3-0 and 40-0 for her, she lose this game and the set for 3-6. It’s possible she started to be too positive “I will win” and she was not prepared to cope with difficulties. The book by Gabriele Oettingen entitled “Rethinking Positive Thinking” talks exactly about this subject and her research on different kind of groups have always showed the same results: you can dream and think positively but at same time you have to take in consideration the obstacles that you will meet to reach your goals and for each of them you need to have a solution. The key words of this new approach are: to contrast the future and the present, in order to do a better performance to achieve relevant goals. In brief, to reach them, the individuals need to foresee the obstacles that will get in the way of achieving the goals. Oettingen’s research shows that finding the obstacles for the future is useful in two ways. First, if the number of obstacles that get in the way is too large, then it can actually help people to decide effectively when they should give up on a goal. Second, when the obstacles are potentially manageable, then contrasting the present with the future gives people an opportunity to plan for how to overcome those obstacles that do come up. Rethinking Positive Thinking is not only an overview of Oettingen’s research, it also gives a simple structure for helping people to get motivated during their journey toward new goals. For this reason she created an acronyme, naming this process WOOP, which means Wish, Outcome, Obstacle, Plan. Rethinking Positive Thinking is a highly readable book, opening a new approach to the use of positive thinking, showing the limit that the optimistic approach and the positive thinking have had in these last 20 years. I personally believe that the extreme use of positive approach as been responsible of the diffusion of the motivators in sport and business. People who try to teach that nothing is impossible if you want. Oettingen showed with research data that this approach is wrong, representing an obstacle to achieve difficult goals. She showed that we need to be optimistic, not in a naive style, but to cope with the difficulties that there will be for sure in any adventure we decide to be involved. Read also: Stop being so positive by Gabriele Oettingen.